Do you want to know more about your scooter’s condition? Or, are you looking to buy a used scooter but you are not sure about its actual condition? Forget all the worries and take ECO inspection services from Droom, India’s first and only marketplace for automobiles and vehicle related services. ECO offers used vehicle inspection that includes used car inspection, used bike inspection and used scooter inspection at very affordable rate. So, forget about contacting a technician or mechanic and taking the scooter to a workshop. Keep aside all the hassles of getting your scooter an overall inspection and opt for our ECO inspection services. To make the whole process easier for the users, ECO provides scooter inspection services at your doorstep. We understand, how much effort it takes to find a good technician and then taking your scooter to their workshop. With ECO as your service provider, you will get to meet experienced technicians who will come to your doorstep at the time you are going to be comfortable with. This way, you can have a proper scooter inspection service at the ease of your home or office at the time which is convenient for you. Used scooter inspection is very important for every scooter that is running on road. 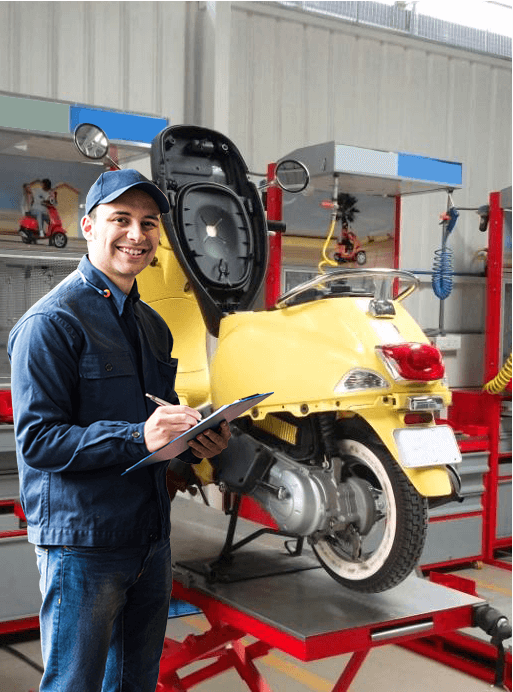 Scooter inspection services from ECO helps identify any kind of problem with your scooter. It will see if any of the parts are malfunctioning or if there is any damage. Also, it will look for issues with the whole body of the scooter focusing on the body paint, damage caused by accident, rust, etc. Also, if you are planning to buy a pre-owned scooter and even if you have already gone through it by yourself, it is recommended that you get it checked by a professional technician. Book ECO scooter inspection service online and get to know if the used scooter you are going to buy has got any damage or other issues.